Autumn is fast approaching and the weather is starting to cool down. Don’t pack up your patio furniture and leave the backyard untouched until Spring, because your patio is the perfect place to throw a party. There are lots of opportunities this autumn to entertain friends and family outside: you can invite guests over for cocktails or a barbecue—if you have a big group of kids to keep busy, you can set up tables outside and do some pumpkin carving. Before you make any plans, you should make sure that your patio is ready for entertaining. Here are the three best ways to get your outdoor space back in shape. Your deck can get really dirty during the summer, especially when it’s used as a dumping ground for muddy shoes and outdoor toys. You wouldn’t want to entertain your guests in a messy dining room, so your backyard shouldn’t be any different. Start by sweeping off the excess dirt and debris from your deck and then scrub it down with a commercial deck cleaner. If you don’t want to exert as much effort, rent or buy a power-washer and spray off all the muck without strain. 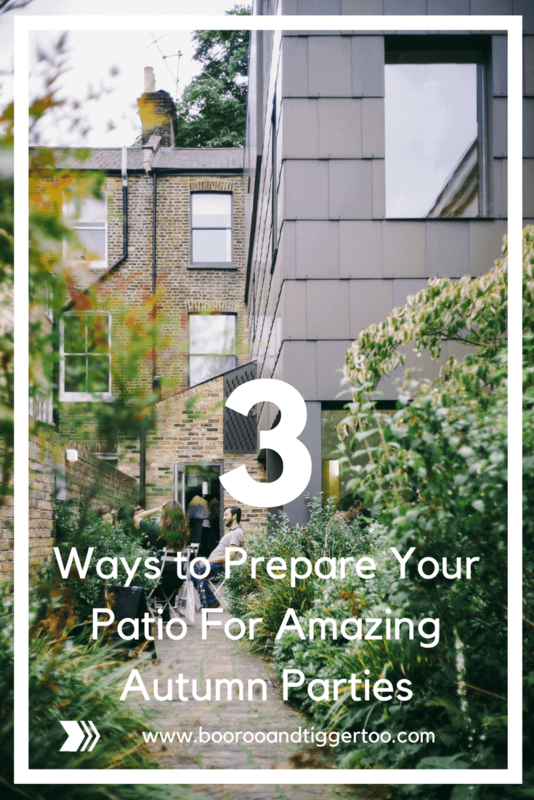 It’s also important to make sure that the patio is still in good condition—it would be embarrassing if someone rested their hand on your railing and got paint chips stuck to their hand; or worse, a splinter. You can save yourself a lot of elbow grease and hire a professional to sand your deck—they can also give it a polished look with a fresh coat of paint or stain. With a little bit of maintenance, the deck will look brand new for your night with friends. Consider opening up your backyard with new sliding patio doors in place of a more traditional door. Wooden or steel doors obstruct the view from the backyard, where glass doors let you see the gorgeous view outside and allow you to peek indoors from the backyard —this is always a benefit if you have kids running around the house. Installing sliding patio doors is a great investment for your home because they bring in natural light and extend visual space, giving the illusion of extra square footage in your dining room or kitchen. Sliding patio doors allow party-goers to move in and out of the house with ease, without any loud slams so that the atmosphere of your party stays easy and light. Now that the patio is upgraded and in good repair, it is time for you to add a little piece of flair as a finishing touch. It is as simple as placing some creative lighting on the side of the railing, around plants, or above the patio. The upgrade is accessible and very affordable —with a quick search online or a trip to the store, your patio can have a striking makeover. Decorating with some lights will make sure your patio party keeps going, even after the sun sets. If you clean up your deck, install sliding patio doors and brighten up your backyard with lights, you will have a terrific event space in your own backyard. Take advantage of the beautiful fall weather and start planning the memorable parties that you have always dreamed of hosting.